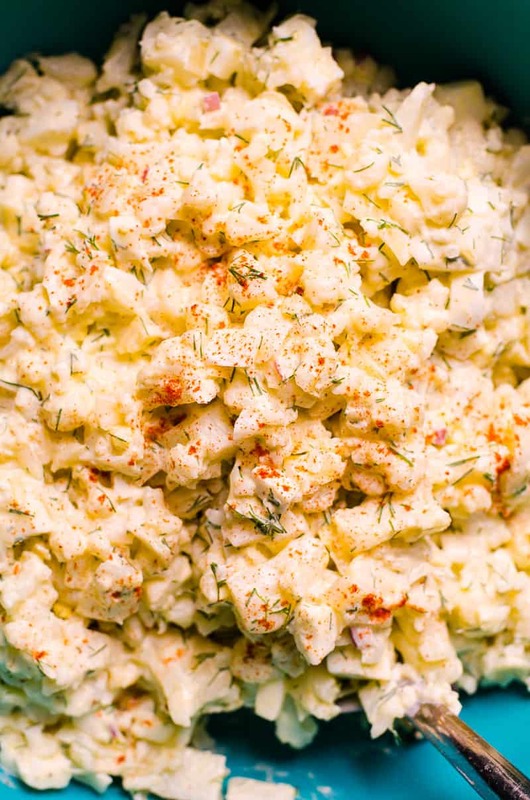 This cauliflower potato salad will blow your mind with flavor and lightness! 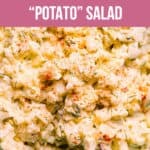 It has creaminess and tang of a traditional potato salad as it contains same flavor components like eggs, mayo, dill and pickles. And yet you can tell you are not sinking your teeth into heavy starchy potato. And at same time you are obsessed! Isn’t 21st century awesome?! This salad turned out way better than I have ever expected! 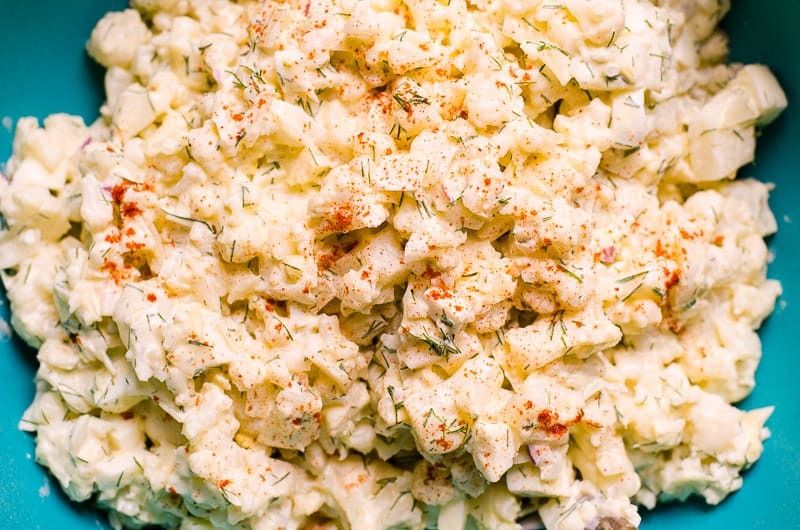 I brought mock cauliflower potato salad to many gatherings like summer BBQ, camping and hockey team parties. Everyone loved it, could tell it’s not a potato salad but still loved it, and asked for a recipe. And just like potato salad, healthy cauliflower potato salad tastes best cold. And even better the next day. Bite size pieces: Chopping cauliflower into small pieces makes all the difference. Not too small, and not too big. About 1/2 inch. Cook al dente: Do not overcook cauliflower until it’s mushy. Perfect mock cauliflower salad has to have a bite to it. Yes. 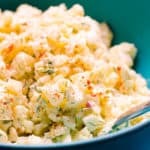 Cauliflower “potato” salad keeps really well in a fridge without becoming soggy or watery for up to 3 days. I took this particular batch camping and it withstood “the life test”. 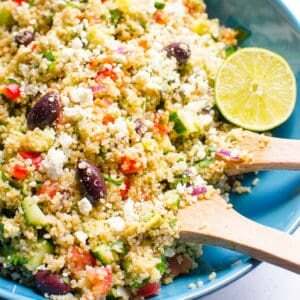 It is also perfect to make during the heatwave to always have a cold veggie side on hand. It’s just brilliant! Make and rate it below! 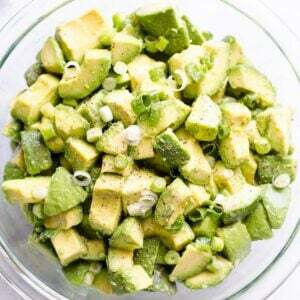 To make ahead: Refrigerate salad assembled but not stirred for up to 48 hours. Stir a few hours before serving as potato salad benefits from flavors “marrying” each other. 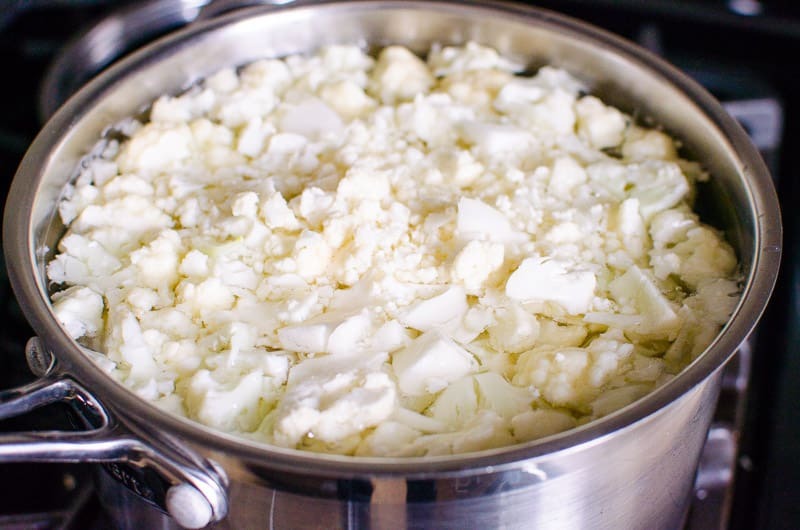 In a large pot, add eggs, cauliflower and enough water to cover. Bring to a boil and cook on low for 5 minutes. Remove the eggs with a slotted spoon and place in a bowl with cold water. Drain cauliflower in a colander. Set aside. 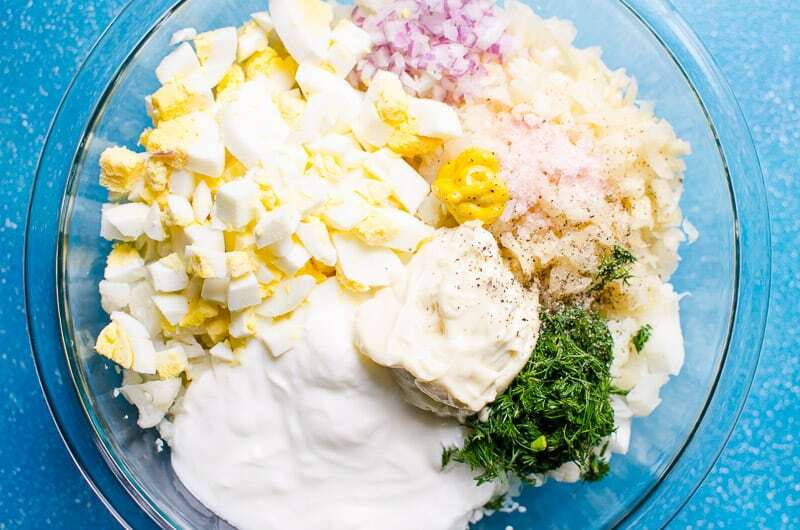 In a large bowl, add pickles, red onion, dill, mustard, vinegar, yogurt, mayo, salt and pepper. Peel and dice the eggs, then add to the bowl along with cooled cauliflower. 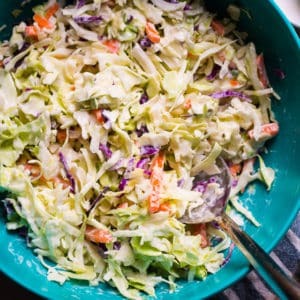 Gently stir cauliflower “potato” salad and if have time refrigerate for 1 hour. It tastes best cold. Imagine you can now stuff your face with potato salad and not get chubby. I learnt over the years that you either love or hate all cauliflower mock creations, and I fall into the first category. 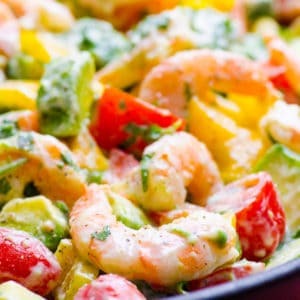 The day I made the salad, I also grilled shrimp skewers. So naturally that’s what it went with. 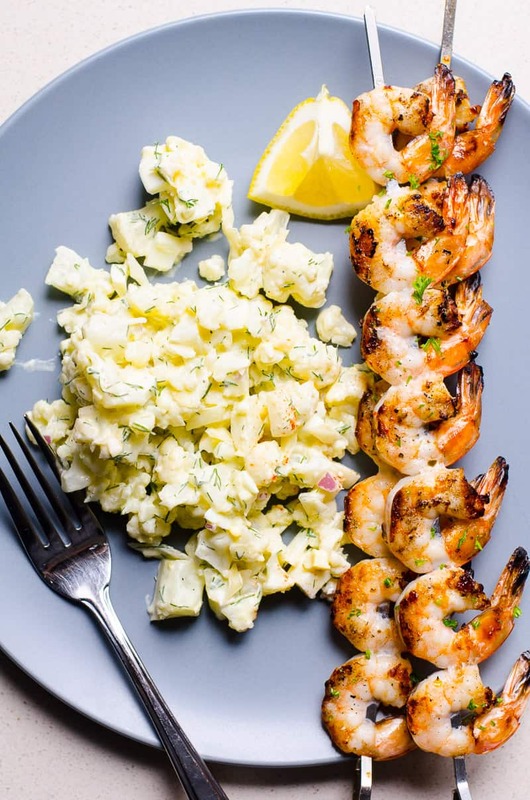 Bring “potato” salad to a potluck or make a low carb or keto dinner by serving with grilled chicken breast, Greek chicken kabobs or cedar plank salmon. 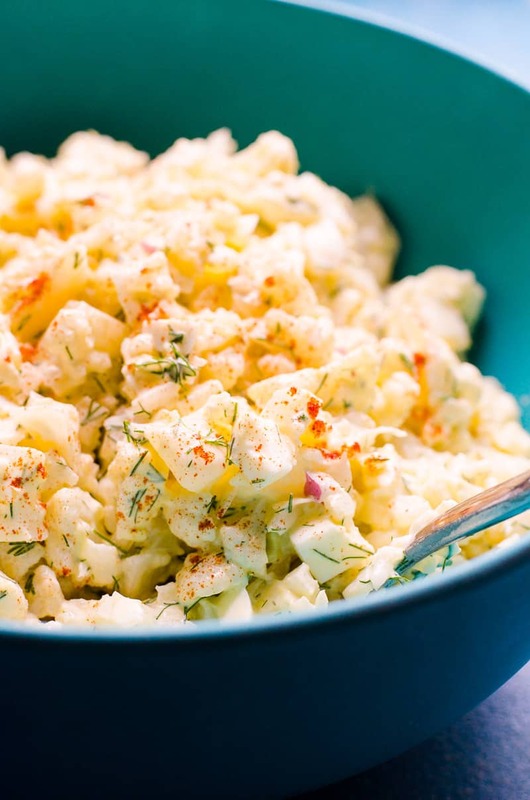 Cauliflower Potato Salad Recipe made with cauliflower which reduces carbs and calories A LOT but doesn’t lack flavour. This mock potato salad will blow your mind!